Please welcome our new First Year Academic Librarian Experience blogger Callie Wiygul, Social Work Librarian at the University of Southern California. Seven months ago, I started a new job as a social work librarian in a city thousands of miles from home fresh out of graduate school. Since then, I’ve been trying to find my niche within my new (and MUCH larger) university and the wider community of academic librarians. I’ve also been working to turn my MLIS project to something that will establish me within the academy. During graduate school I worked in a public library, and before that I worked for nearly a decade in the corporate sector. This journey from the corporate to public to academic world has uniquely positioned me as a flexible communicator, perceptive learner, and ambitious librarian. But are these traits and my MLIS portfolio enough to establish me within the highly competitive and often individualistic world of academia? For months (years!) of uncertainty, I have struggled to claim a place within the community of academic professionals. There is no set path to this goal. There’s not even a defined starting line, nor is there a finish line and Jumbotron to announce “You can stop running now, Callie, you’ve made it!” I have also learned that librarians must fight to convey our value to our institutions, subject faculty, and even students. Even more, I have learned that we also must convey our value to each other–our colleagues in librarianship. The struggle is real, y’all! Publication, programming, service, leadership: all of these are common ways through which librarians establish themselves on campus and within the larger library community. But how do you become an established librarian before you have discovered your niche within the profession? It’s not like there’s not enough for a first-year librarian to worry about already: burnout, imposter syndrome, and navigating the idiosyncratic politics within academia. This doesn’t include the challenges of serving as the liaison to a body of approximately 1,200 graduate students and 100 faculty at four academic centers in Southern California. But when I feel overwhelmed I try to remember that my incredibly successful colleagues were all new librarians once, too! Shocking, right?! It’s a borderline platitude, but this sentiment gets lost in the chaos that is venturing out and making a dent in the universe (just watched the new Steve Jobs biopic, sorry!). Instead of seeing barriers, I choose to view this experience as it is: a) my job, and b) a huge opportunity. I am a big fan of asking questions and soliciting advice from veteran and rookie colleagues alike. I began venturing forth from my comfort zone on Day One and met with colleagues over lunch. I asked for feedback on my manuscript draft, posited questions about the underpinnings of reference and instruction programs at my institution, volunteered to join campus committees, and vetted ideas about programs and events to colleagues both within and outside of my liaison area. Of course, none of this was carried out without anxiety! I’m almost always terrified when anyone—even closest friends and family—reads my words or hears my ideas. But this going-out-on-a-limb experience has unequivocally made me a better writer and thinker. Reaching out to fellow instruction librarians and asking them if I could observe their instruction sessions has introduced me to lesson plans and teaching styles that have definitely made me a better educator. I apply for (what seems like) countless leadership programs, calls for proposals, and grants because I am hungry to explore my interests in leadership, programming, and instruction not only to establish myself as a professional, but to become a better librarian as well. And, honestly, I’ve been turned down more times that I care to admit. But, hey…it’s par for the course in academia. So how do I find a niche to call my own and the academic bona fides to give weight to my name? In everything I do, I consistently ask myself “Is this marketing tool/program idea/reference answer/FAQ submission helping people? Do I truly feel compelled to do it? Is it only because it is a hot topic on Twitter?” These questions often help me parse out the crucial from the superfluous. They also provide insight into potential career interests and goals. It’s easy to fall down the proverbial rabbit hole of following others. So many librarians are superstars at what they do and have become “library famous” for their achievements. I’ve learned that as a new librarian, you can get caught in the vacuum of trying to follow every Twitter chat, read every article mentioned in said Twitter chat, while blogging about being a librarian, applying for grants, and developing new ideas. The Digital Age can be just as dizzying and disheartening as it can be nurturing and inspiring. Here is where I believe perspective can bring things into focus. Instead of guiding my work with the intent on being a superstar, I guide my work by focusing on my growth as a librarian. I must find ways to design programs and ideas that will help faculty and students attain their research goals. At the same time, I must develop the confidence to create my own ideas and take advantage of my own abilities. That is MY goal. It has to be, because if my actions are simply founded on the desire to be library famous or earn the respect of the academy, they won’t be meaningful. I’d rather cultivate my niche and excel at it in a way that is both personally fulfilling and helpful to my students, colleagues, and university. Finding a niche and establishing myself won’t happen overnight, but it will if I stay focused on the bigger things and keep my fears and ego in check. 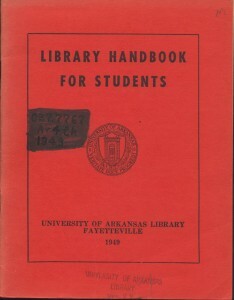 Please welcome our new First Year Academic Librarian Experience blogger Jason Dean, Assistant Librarian and Head of Special Formats Cataloging at the University of Arkansas. To be frank, I felt a bit like a pretender. Yes, I have a master’s degree from a top-ranked library school, and I had several presentations and one peer-reviewed article published, but my fellow faculty members at the university are titans of their fields. One colleague comes to mind – he is teaching at Oxford this semester, and has published several books to much acclaim. In the library, there are faculty who have published widely, and to great recognition – so I felt a bit like a pretender, much like many other first year tenure track faculty. But, they hired me. There was a national search and some of the most rigorous interviews I have had in my professional career. After that rigorous process, they selected me to fill the position. 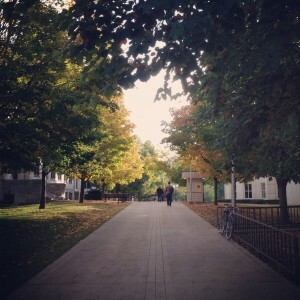 People seem to be very happy to have me here, and more than that, I feel as though I belong here as a faculty member. And in the six months since I started this position, I feel as though I’ve blossomed here. Unlike Moses, I do not presume to deliver you wisdom from the mountain, but instead, reflections on why I feel at home here, and why I feel that I can succeed in tenure and promotion amidst such august colleagues – and furthermore – which of these thoughts might be pertinent to my fellow first year academic librarians. Second – the currency of the realm in academia is the written word. It behooves the new faculty member to write well, and often. Write in a private journal, blog for yourself, or for others, and work on your tenure-related publications. You have interests you would like to research – pursue those. Write about things that you see that intrigue you, or spark your objection. Write well-crafted emails. Many times the first impression of a new faculty member is not made in-person, but through the medium of their writing – so make that as good as it can be, and continually improve through practice and criticism. A natural complement to writing is reading. You should read. Ravenously. Read blogs, journals, and newspapers that you enjoy and that are pertinent to your field. Here at the library, faculty members can be “routed” on new publications, and I am probably on the list for more than is logical – but it exposes me to a wide array of journals it would cost me thousands of dollars to subscribe to. Journals of rare books, librarianship, and history are on my list. Read widely, talk about what you’ve read, and connect your reading to your job, or your research. Excel and exceed. 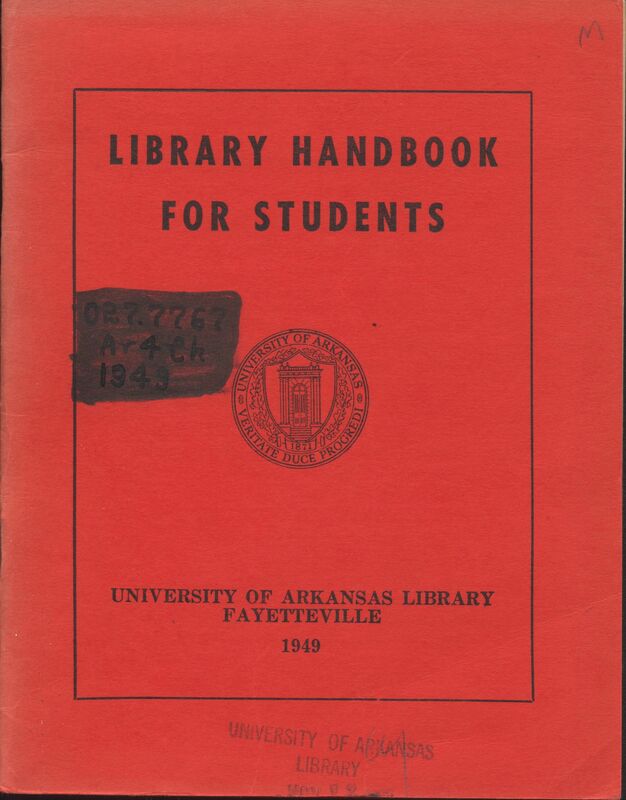 The tenure and promotion process here at the University of Arkansas and for librarians specifically is quite clear, thankfully. Find out what the requirements for tenure and promotion are – and though the requirements are high, exceed them. One publication a year? Do two. Start serving on national and international committees. 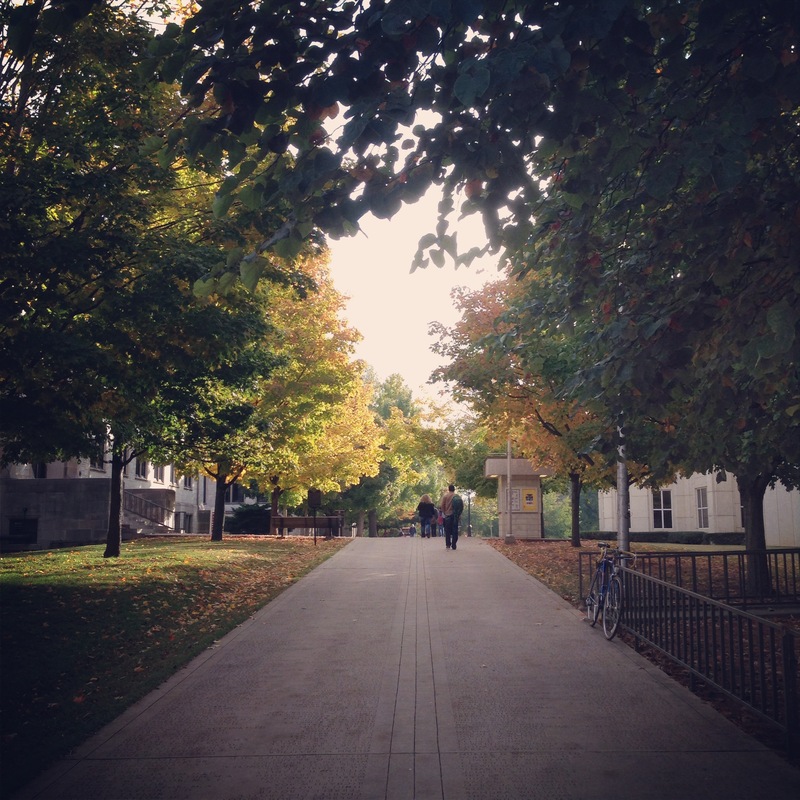 Publish with colleagues outside the library in your institution and beyond. And do these things well. When does one do all of these things? Well, perhaps that’s a topic for another post. I want to close with a picture – a picture from the University of Arkansas’ campus that shows why fall is the most magical time of year on college campuses – that it is a time of new beginnings, and one of lovely color.